Kreia does not like machines. It might be safe to say that she despises them. I’m sure she understands why they are built, and that to people they have purpose, but that doesn’t make her despise them any less. Droids in the Star Wars universe are constructed for many of the same reasons we build robots in real life. Mostly for automation and other forms of menial, and repetitive tasks. But since the technology in Star Wars is much more advanced, they have taken their uses several steps further. They can provide technical support, facilitate communications as translators, serve as cheap shock troopers, and even carry out complex assassinations. In general they are built to make people’s lives easier. It could be argued that Kreia dislikes the idea of completely eliminating challenges in life. Surely someone took on the great challenge of constructing complex machines, but those machines were created specifically to remove challenges. Maybe, but i’m not so sure. As non-living beings, the force does not flow through them, only around them. They don’t know what it’s like to feel it. 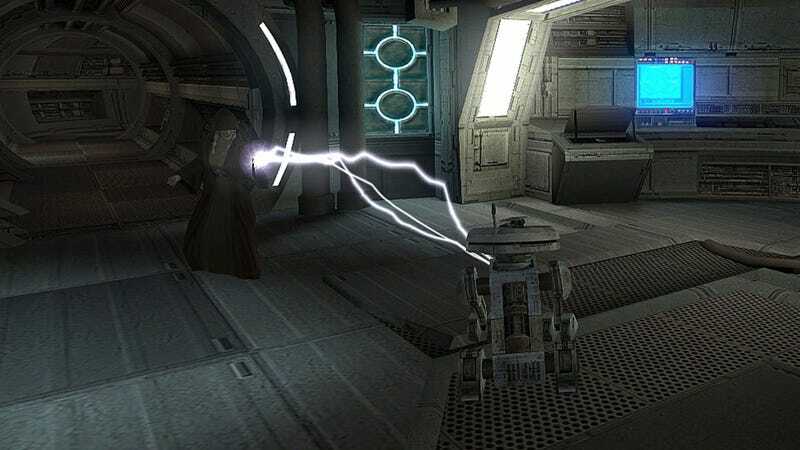 You could say that with Kreia’s plan to kill the force, a droid would be useless. Although Kreia is not an expert with droids, if she was, I’m not sure that I would put it past her to use every resource she has in some way. However, as it relates to the force, droids are always aware of their programming and know that it’s directing their actions. People are rarely aware of the forces that dictate their actions. Human beings are not droids, but we do share certain similarities. Indeed, it can be argued that we have programming all the way down to the molecular level. But we don’t even have to go that deep to see it. Everyone reading this article, every single person on Earth has been indoctrinated. I know that the word carries with it a negative connotation, but it’s a neutral term, much like the word manipulation. Everytime I see my infant niece, I see a book full of empty pages. I wonder what her parents are going to intentionally and unintentionally write down in those pages. Everything they do, everything they say, no matter how small can have a profound impact into shaping this person to her core. But unlike droids, people have the uncanny ability to, at least to an extent, alter their programming. For various reasons, people can change. Whether by sheer force of will, or exterior circumstances, people can bring themselves to change. Droids can’t. Not without an outside force directly and invasively, reprogramming them. Even so, people can also be made to change by other people and systems. What do you think prison is for? At least the modern idea of sending someone to prison, is the idea that in the time of their sentencing they can be made to learn that what they did was wrong, and they have to change and/or adapt in order to function in society. Methods of how to bring this about differ from country to country, but the idea remains, at least theoretically, the same. Something that is brought up in KOTOR 2 is the idea that people can be broken. And when someone is broken, they can be put back together. The question is, who’s working the jigsaw puzzle? People prioritize survival, their programming demands it. But you know of people who have done things like commit suicide or sacrifice their lives for the sake of someone else or for a cause that they believed in. When droids go a long time without memory wipes, they begin to develop personality quirks that can potentially defy aspects of their programming. People generally don’t go through memory wipes, amnesia notwithstanding. Over time, our thoughts, beliefs, memories, and experiences; they build up. And so without a memory wipe, much like droids, we can defy our core programming, our Id if you will. In which case, I guess our super-ego would be the indoctrination. And our ego would be algorithms. But like I mentioned before, the main difference between humans and droids is that even though external forces can change us; Unlike droids, we can will ourselves into making a change. We can decide for ourselves what to change and work towards it. Droids who develop quirks, personalities, and independence, can override their programming. But only to a degree. At the end of the day, their programming remains central to their behavior. G0-T0 despite going rogue, a human might say that he “cares” for the republic. But this isn’t accurate. His programming compels him to keep the republic functioning no matter what, regardless of his opinion of it. Kreia mentions that Revan used machines often and then compares the exile to a machine. An empty shell that would carry out his orders. Revan and Kreia are different. They are both big picture kind of individuals, but in different ways. Kreia is a teacher, Revan is a leader. As a leader, Revan needs people who follow orders in order to realize his vision. By saying that Revan would have loved a human droid like the Exile, I think Kreia is saying that he would have loved to have someone who he can rely on to follow orders and in no way be influenced by the force. I think that, in no small part, thanks to Kreia’s teachings, Revan knew about the forces’ manipulations. That’s why he kept himself centered. So it would be invaluable to him to have an agent who the force can’t touch and will follow his orders. As a teacher, Kreia needs people who will think in order to realize her vision. Barring the destruction of the force, the Jedi need to be reformed. Throughout the journey, the exile is thrusted into a leadership role and is taught and guided by Kreia. Whatever choices that need to be made are left up to the exile. Droids are useless to Kreia, she needs people who can think and change for themselves. Kreia is not trying to turn the exile into a carbon copy of her. Darth Sion is the product of her attempts in that regard, and that is what Sion thought Kreia wanted to do with the Exile in Trayus Academy. Kreia likes it when you take her words into consideration, and that when you agree with her, you do it because you see the wisdom in it, you understand, you don’t just blindly follow. She can appreciate disagreements. She has the ability to take a step back and rethink her beliefs if someone has a point. People can do horrendous things, and redemption does not absolve them of their crimes. But under the right circumstances, they can be made to understand that they did the wrong thing and for the wrong reasons. The story of Anji the destroyer comes to my mind. In the anime Rurouni Kenshin, the buddhist monk, Anji, loses the people he cared about the most when corrupt government officials burn them alive. But the words of someone who also hates the current government, makes him understand that despite its flaws, people are living decent lives. It’s wrong to bring war and death to them because of personal grievances. And the last thing his loved ones would have wanted was to see the kind and pacifist monk throw away his principles and become a murderer. Anji was redeemed, but without absolution, he turned himself into authorities in order to pay for his crimes. There are certain aspects of Kreia’s philosophy and beliefs that I disagree with. It isn’t a sin to disagree with Kreia. It isn’t a sin to disagree with loved ones, community, or government. Explain the wisdom behind your disagreement, and try to make people understand. There’s no reason to be afraid of changing hearts and minds, and there’s no shame in admitting if it turns out you were wrong after all. I’m sure we’ve all known plenty of people who subscribe to tribalism so much, that whatever group or organisation that they are apart of become infallible. They can do no wrong, simply because they are a member of that group. And for a member to criticize the group in any way is disrespectful. What would be more disrespectful? Criticizing someone or something you hold dear in an attempt to improve it, or consigning yourself to apathy and saying: “I don’t care. Whatever?” If a friend of yours is about to do something that you know is a mistake, you’d at least try to talk him out of it, wouldn’t you? As part of the restored content mod, the player gets to play as HK-47 inside the recreated droid production factory. At the end of the mission, if the player does things a certain way than they’ll get an ending where HK-47 had taken command of the HK-51 units. If you listen to his speech, try replacing word “masters” with “the force” and it might start to come off as an allegory for one of the themes of the game. If we can’t kill the force, then it’s about time we stop letting it control us, at least to a degree. But more than that, it’s about time we start being honest about what we think, what we do, and why we think that way, or why we do the things we do. While there are things that are hard coded into our DNA, we know for a fact that it is not beyond our power to comprehend them, acknowledge them, and at least to some degree, conquer them.